This is the sequel of "Italian Neighbours"- the adventures of an Englishman and his wife in Italy.I enjoyed the first book a lot and ordered the second one from Amazon.com. Most probably I shall set a bookring (ray?) for it after reading. My bookray for "Italian Neighbours" is quite successful,so probably there will be people wanting to read the second part,too. I`m reading it now and enjoying it very much. It is a funny story about Italian parenthood culture and traditions,and how Parks family brought up their own kids in a country where children are loved most of all and not denied anything:-)). I laugh out loud at some places and I love the small,daily details which give you a clear picture and rich information about the thinking of Italians. The humour is loving and symphathetic,not at all arrogant. It is going to be an international bookring. The bookring is closed now. Finished reading and mailed to the first participant.The last chapters were not so interesting but as a whole I liked it very much.It was interesting to learn about Italian parenting traditions.I like that the writer narrates only from his experience and doesn`t offer the usual sophisticated travel book. Sent to the first participant. Arrived today from Bookmanic70, thanks. I've just finished a ring, so this will be next up. .....And finished this in the early hours of this morning. I LOVED this book. Tim Parks brings Italy alive and we can see Italy through the eyes of a Englishman living it Italy, bring up his two children as Italian. Fascinating details of parenting in Italy and the view of the bambino's! I especially loved the scenes where he takes his son fishing! I'm looking forward to reading the first book (ring from bookmanic70) and I expect that it won't be too long before I am tempted to get a copy of these books from Amazon. Thanks for sharing this one bookmanic70, I really enjoyed it and hope the rest of the ring BC'ers do too. To be posted off to Lisa-B in Germany today. Received today. Thanks for sharing it! A very interesting and entertaining read. The author is extremely perceptive, for the smallest details, and his prose has a nice flow. I would like to read "Italian Neighbours" some time, and I am curious about his fiction. In fact I knew the author's name from a very positive book review for one of his fiction books. 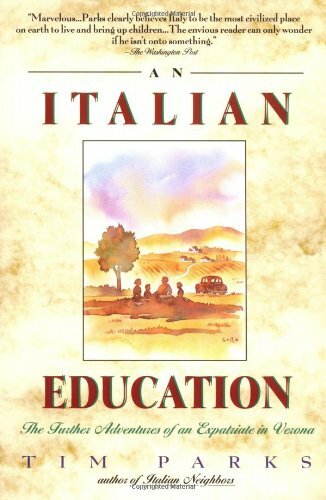 Nevertheless, I began loosing my interest in Italian Education a bit after about 2 thirds, as it happened to bookmaniac70 also, therefore a 7-rating only. The book will be mailed to Kiki66 tomorrow. Sorry - now it will take a little longer - I am going on holidays and take the book with me - will post it as soon as I am home again (August 22nd) - promised!! Well, after reading all the other journals I feel quite bad to admit that I couldn't get into this one.. I tried, but somehow it was a bit boring to read. sorry. I also didn't like some of the obvious platitudes against other nationalities... or was it just me being annoyed by the comparison of the Teutonic German in Alto Adige to all the other Germans in the World?? I know there are obnoxious kinds, but in which country there aren't?? The book arrived this sunny morning with 2 other english bookrings. I read it as soon as possible. I'm very sorry but I think the same as Kiki66. I send it to the next on the list. Received today - thanks icila for sending and to bookmaniac70 for organising the ring! Posted B Post sometime last week (ie after 2 dec and before 8 dec) Sorry, forgot to make a note! Arrived safely. I've just finished Italian Neighbours so this is very timely. Thanks redhouse, this book arrived today in the mail. I could use a good dose of sunshine after all the rain we are getting here on the west coast, so off to Italy I am, care of Mr. Parks and bookmaniac70! This was a great book. Light, fun and entertaining! I enjoyed the anecdotes and thought that the authour had quite a good insight into Italian culture. I wonder what those children are up to now? Do they consider themselves Italian, or English or both? Ready to go to JDT. Happy to receive this well-travelled book in the mail today! Especially looking forward to the Italian setting. Thanks to everyone before me! Enjoyable read, especially since we've had the chance to visit Italy three times in the last year and a half. Some observations ring true: the attachment of sons with their mothers, the rapt attention focused on small children by parents, grandparents, neighbors. On the other hand, some observations about children seem universal rather than specific to Italian children. Young children from most cultures tend to call for mama when hurt or in need; this is not an Italian phenomenon. Also the exact same poem honoring mothers, illustrated with their child's handprints, is used extensively in preschools and kindergartens in the US, and perhaps other countries as well. Warm-hearted, affectionate musings from an involved father. Ready to send on to Mamikaem. Thanks to all before me! I have a few rings in front of this, but will get to it as soon as I can. I never got an chance to read this due to long work hours and an overload of book rings and rays. I sent this back to bookmaniac70 yesterday. Thank you for the opportunity! The book returned safely in Sofia. Thanks everyone for joining my ring and taking your time to read and comment. Traded the book, loved it, will read gobs more by this author, and am passing it along to a friend now.